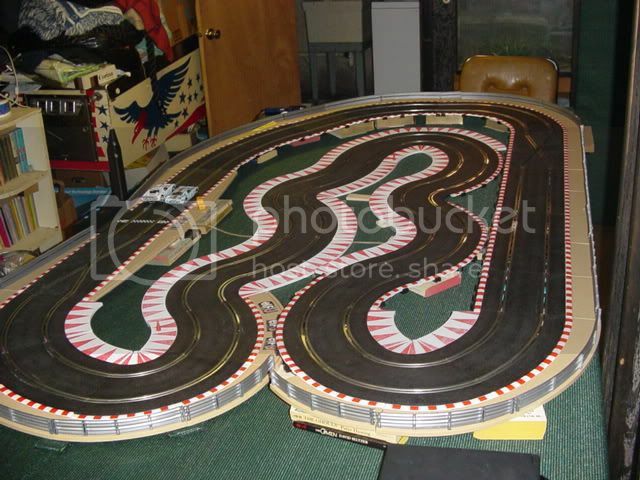 This track has most cars running in the mid or upper 4 seconds. I mixed Sport and Classic and some 1/2 #2 curves to display the borders I used. Any track edges without borders have curbs. The large outer loop has the wider Sport borders which bumps the width up to about 4'3". Using curbs and barriers on the straights will keep it within the 4'0" requirement. I set it up with some temporary elevation changes. :clap I love twisty circuits. What would happen if turn 3 was extended over turns 6 and 7 (they would tunnel under) changing the elevation to a twisty run up to turn 3 and a wild ride down through turns 4 and 4a? That would be cool, Steve :wiggle But this track will be fastened to a 4X7 board intended to be stored vertically so we are not too keen on a bridge. We thought some small (1") elevation changes would add a lot of interest :spin My idea was to elevate only the back straight, Mark thought that raising the perimeter would be better. 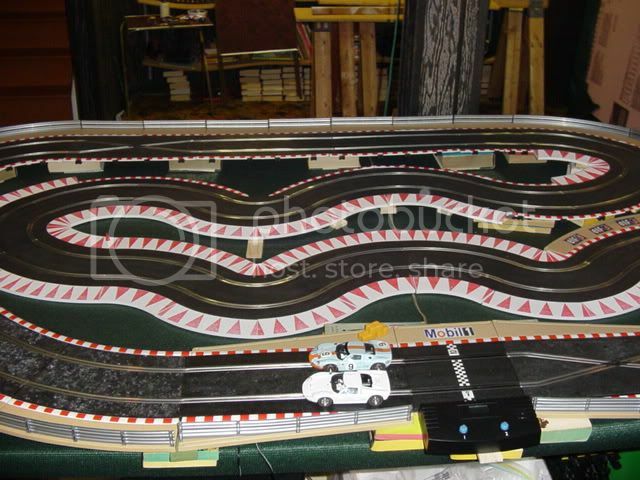 hey do you have a list of the track that you used for this layout...it is awesome!!! Any way this "Bird of Prey can work on a 9x5 with Ninco?? Here is the Ninco version. Closeness (which gives you an idea of how well the pieces will fit together) is 2.25 cm, which isn't too bad. Overall dimensions without borders are 2.28 m x 1.31 m or about 7' 5" x 4' 3". You can use 2 R2s in place of the crossovers. Pete - the photo is missing on your post. Can you email it to me or re-post? this is a great layout thanks for your input. I know this is an old thread, but how does this layout run? Anyone use it? All times are GMT-8. This page was generated at 03:46 PM.